The Pololu serial 8-servo controller allows you to control up to eight RC servos with almost any robot controller or computer. 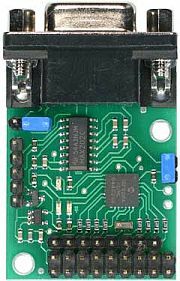 The interface to the servo controller is a standard RS-232 serial port or a TTL-level serial line, using any baud rate between 1200 and 38400 baud. Multiple 8-servo controllers can be connected to a single serial line to control up to 128 servos independently. The servo controller is also compatible with the Scott Edwards MiniSSC II servo controller and any software written for it. You can purchase the servo controller as a partial kit that requires soldering of the through-hole components (header pins and DB9 connector) or as a completely assembled unit. For a tiny version of this 8-servo controller, see our micro serial servo controller. If you are interested in controlling more than 8 servos, you may want to consider the 16-servo controller or the USB 16-servo controller. Note: The Pololu serial 8-servo controller is not a standalone device: to use it, you must connect it to power supplies, servos, and a main controller that you program to send commands to the servo controller.